The Department of Tourism (DOT) has geared up its promotion of the Philippines as a destination for the lucrative cruise ship market. In 2013, a total of three luxury liners have made their maiden calls on Manila and other top tourist destination shores of the country. 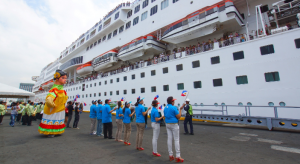 Last 9 January 2014, MV Costa Victoria of the world-renowned Costa Cruises carrying a total of 1,775 passengers also made its maiden call on Manila after visiting Puerto Princesa and Boracay,. Meet-and-greet and farewell activities were organized for the passengers of the different cruise vessels, showcasing the distinct Filipino hospitality and local cultural performances, setting the Philippines apart from other cruise destinations. 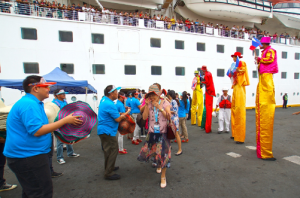 These fun ceremonies were attended by officials of the luxury vessels, DOT, Philippine Ports Authority, Philippine Coast Guard, and the City of Manila among many others. The illustrious Royal Caribbean’s Legend of the Seas also sailed first on Philippine waters in early 2013, dropping its anchor at the Port of Puerto Princesa as part of a seven-night Borneo Explorer Cruise. M/S Superstar Aquarius and M/S Superstar Gemini, both luxury liners of Star Cruises fleet, docked for the first time at the Eva Macapagal Passenger Terminal in Manila South Harbor in October and November 2013 respectively, after visiting Boracay as part of a 7-day Asian tour. Over a thousand cruise passengers were on board, who all enjoyed an overnight stay, island tour, and fun entertainment before finally returning to their homeports in Kota Kinabalu, Sabah. 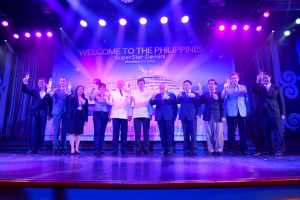 Tourism Assistant Secretary Benito Bengzon, Jr. in an interview said that the inclusion of the Philippines in the Southeast Asian cruise programs of major cruise lines is considered a milestone for the country’s cruise industry. “This is definitely a clear indication of the country’s improving image as a port of call for cruise ships in the region. And it should encourage us in the government and our partners in the private sector to invest more in developing our ports to attract cruise companies,” Assistant Secretary Bengzon added. Cruise tourism is one of the major products being developed to enrich the country’s tourism offerings. For 2014, the DOT is anticipating a total of 23 vessel calls bringing an aggregate of 24,000 cruise passengers. “The Philippines has great potential to capture the growth in the Asia Pacific market. Quite tellingly, this growing demand for cruise tourism signals that the Europe and US-dominated market is now slowly moving to this side of the world. We must be ready to respond to this demand and ensure that the rising global perception of the country is backed by real developments and hardwork,” Tourism Secretary Ramon R. Jimenez, Jr. remarked.